A Canadian friend, suffering from gray sky overload and no doubt feeling a little frustrated with his endless winter, recently asked if we ever get tired of clear blue skies, day after day. You know, it's all a matter of what you do with those skies. 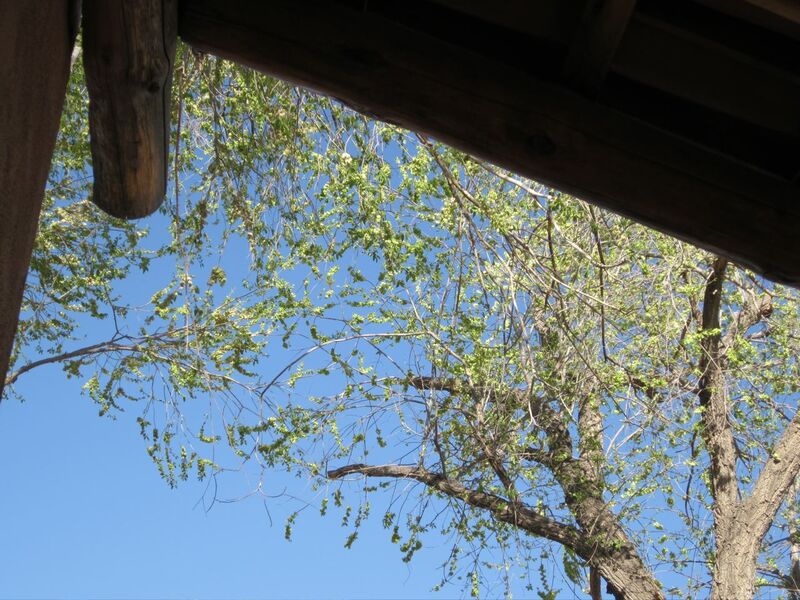 On this particular day, we were sitting in the shade on the porch of our adobe house, sipping a bottle or two of Moose Drool, watching the play of sunshine and shadows on the Chinese elm buds, gazing up at the Organ Mountains, and feeling far too pleased with ourselves. 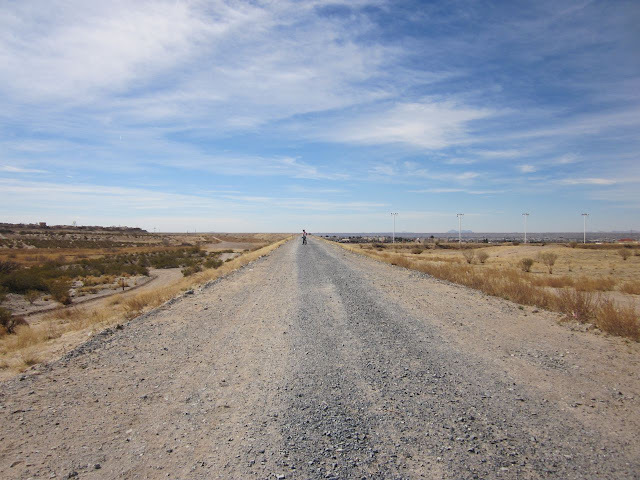 I'd say we were making very good use of just another boring day of sunshine here in the desert of southern New Mexico. To see how people are coping with their skies, boring or otherwise, please be sure to visit Skywatch Friday. Last year was my first experience with planting cacti. I bought my plants from a local nursery and assumed that they could survive any weather in our high desert climate--the cold winters, the baking summers, and the temperature extremes ranging from 10 to 100+ degrees F.
This past winter was a difficult one with a prolonged spell of 9 degrees F. In a "normal" winter (do we have these anymore?) we might occasionally get down that low in the night, but the temps usually rise well above freezing during the day. Not this winter! Everything suffered, plumbing was a mess, and a good many plants were killed off. 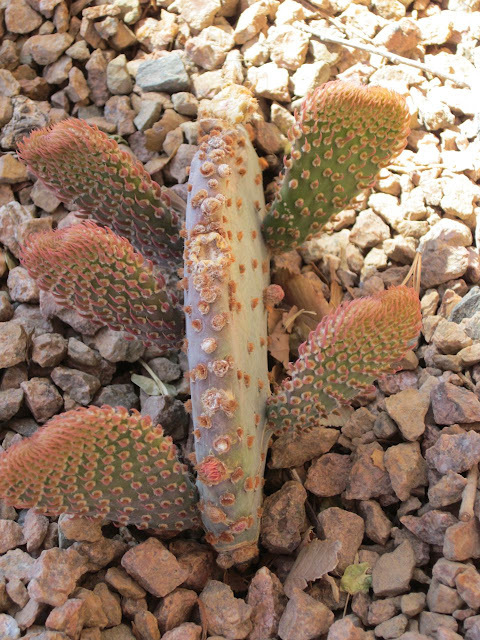 My barrel cacti were victims--you can see them here, back when they were thriving. 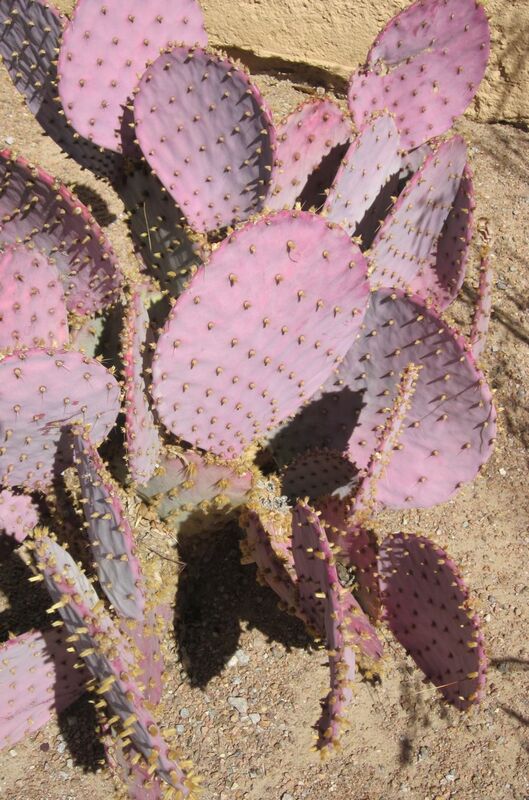 However, all three of the prickly pear cacti survived and are making huge strides this Spring. If you want to know more about prickly pears, you should check out this DesertUSA page, which includes all kinds of information, photos, and even a video that shows prickly pear food products (and margaritas!). I also found an article on Wikipedia that explains, among other things, that parts of the plant can be used as a binder in the making of adobe. 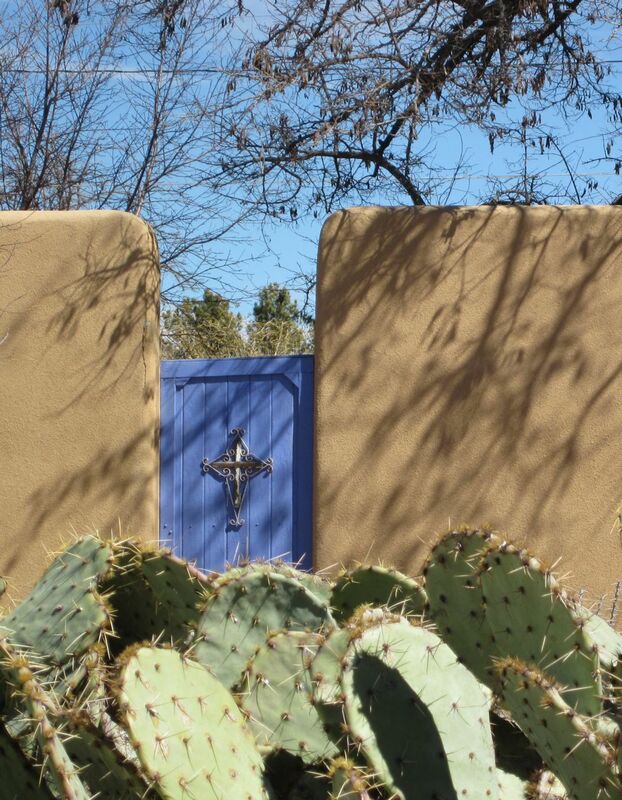 Obviously, these surviving cacti were the perfect choice for growing along our south-facing adobe wall. I like my mysteries with a little "value added"--that is, I like to be learning a bit about an unfamiliar time and place while enjoying a good novel. 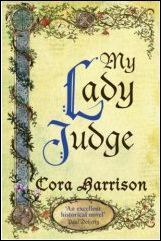 These books, part of a series called the Burren Mysteries by Cora Harrison, are just about perfect as far as I am concerned. 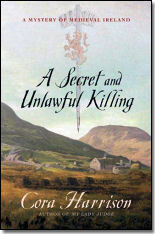 They are set in the early 1500s on the Burren, on the western seaboard of Ireland. So far, I've learned about the stony fields there (look at the beautiful album of Burren photos on the Cora Harrison website to see what they look like); bits of the Gaelic language; a fair bit about Brehon--early Irish--law, which is very different from English law; and I have come to admire Mara, the female judge and heroine of the tales--I love the way her mind works! Even though I understand the need for flood control in a place that can get a lot of its annual rainfall in two or three good storms, I am still fascinated by the fact that a great big earthen dam stretches across the desert city of Las Cruces. It's an interesting ride. 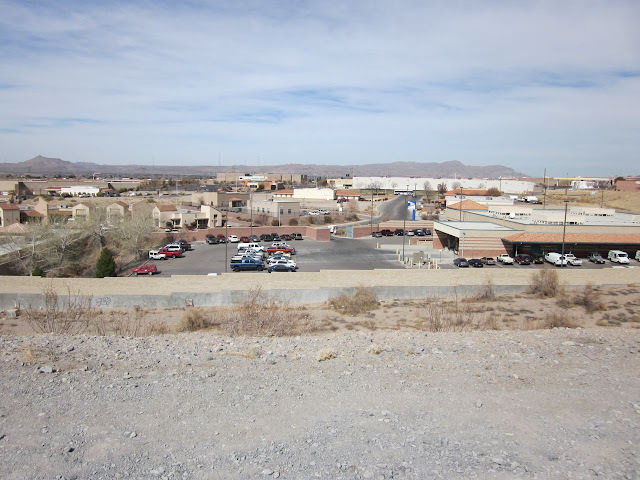 Looking up toward the mountains, you see desert scenes. In the other direction, it's all urban with distant views of more mountains. That's Picacho Peak on the left. Our house in nestled in the rural area of the fertile river valley at its foot. These were the skies over the Tularosa Basin as we drove back from a trip to eastern New Mexico a few weeks ago. 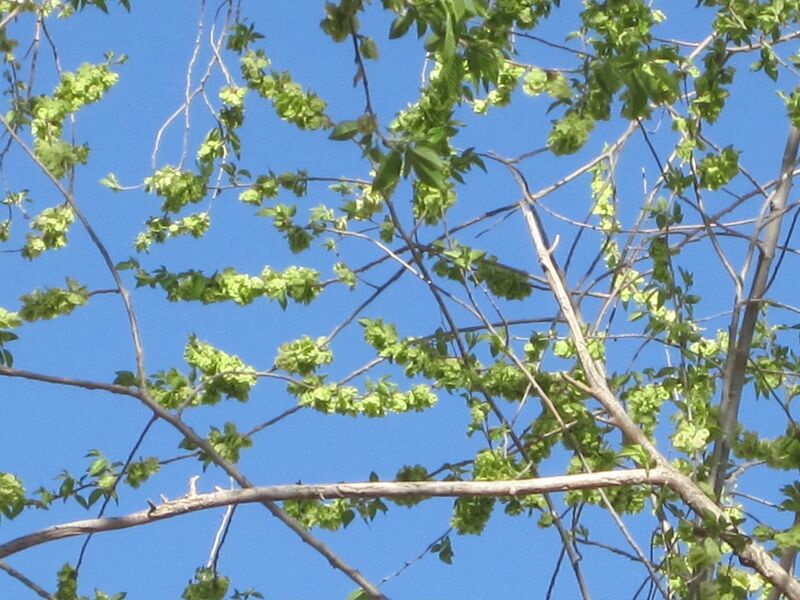 For sky photos from all over the world, please visit Skywatch Friday. 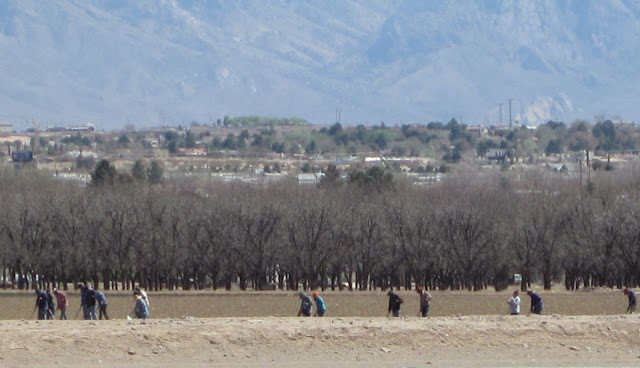 For two days I watched these farm workers with hoes make their way down each row in this field of newly-planted cabbage across the road from our place. 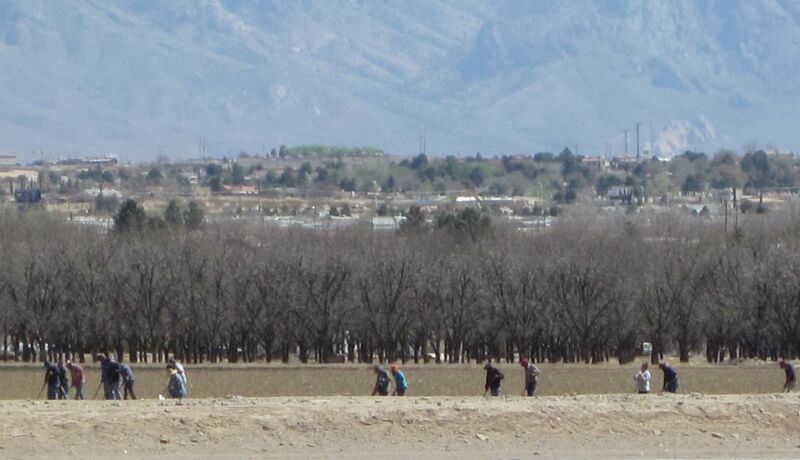 There were at least three times as many workers as shown in this photo. They started at sunup each day and stopped work eight hours later when it was too hot to do any more. That's an awful lot of man- and woman-hours just to grow cabbage, and this isn't counting the days of plowing--slow-moving tractors spend a lot of time grooming this field--and the planting and irrigating. Of course, there is still the cost of harvesting, processing, and transporting the cabbage to market. This has given me a lot to think about whenever I look at the cost of vegetables. Our Lady of Health in the old Las Cruces Mesquite neighborhood is my favorite church to photograph. 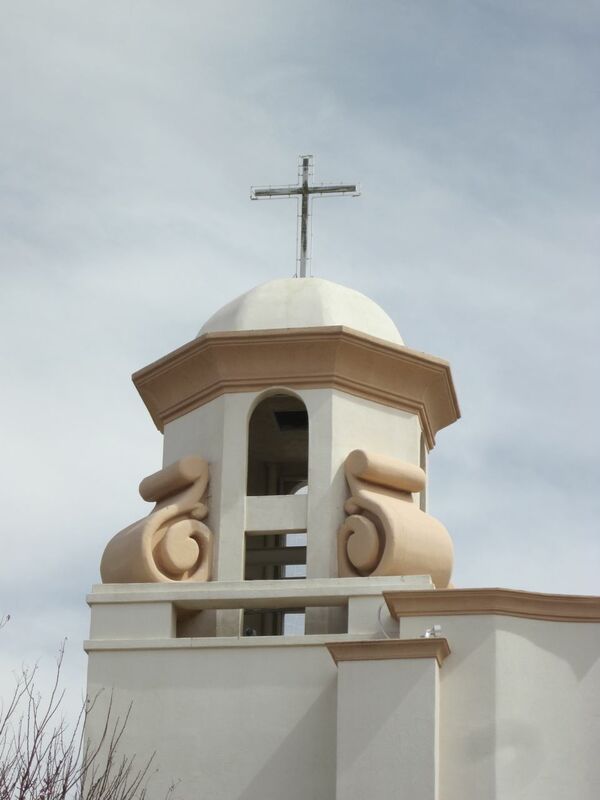 The crosses are outlined in blue neon, a beautiful (and so Southwestern) sight against the nighttime desert sky. You can get an idea of what they look like when lit here, in this photo taken at dusk. It's been a horrifying and difficult week. We've all agonized over the situation in Japan and tried to imagine that we might be able to make a difference, one of us at a time (see Becky's Blog: For Japan). We were haunted by the plight of a suffering little donkey and wondered if there was a way to free him (there was, and it happened!). 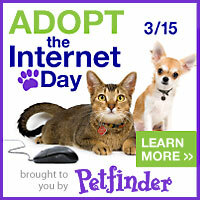 We observed Adopt the Internet Day (see Let's Hear It For the Underdog), which featured so many deserving animals hoping for a home with love and safety. An old man walking along the beach at dawn sees a young man picking up the star fish and throwing them out to sea. "Why are you doing that?" The old man inquired. The young man explained that the starfish had been stranded on the beach by a receding tide and would soon die in the daytime sun. "But the beach goes on for miles," the old man said. "And there's so many! How can your effort make any difference?" The young man looked at the starfish in his hand and without hesitating threw it to safety in the sea. He looked up at the old man, smiled and said, "It will make a difference to that one." Adobe houses are made of mud. They need a certain amount of upkeep and care or they will return to the earth from whence they came. 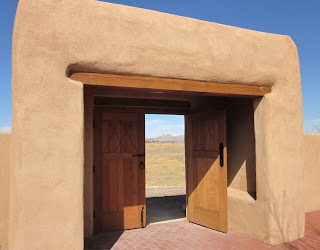 My house (not shown, but you can see it here) is made of adobe. I take care of it, keeping this place in mind. 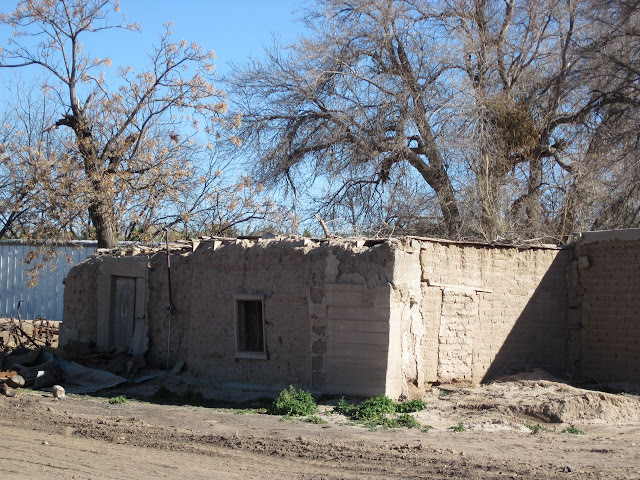 This abandoned and crumbling mud house is in a beautiful setting with trees and fields all around and wonderful mountain views. Once a place for a family's dreams, it is now a ruin melting back into the ground. 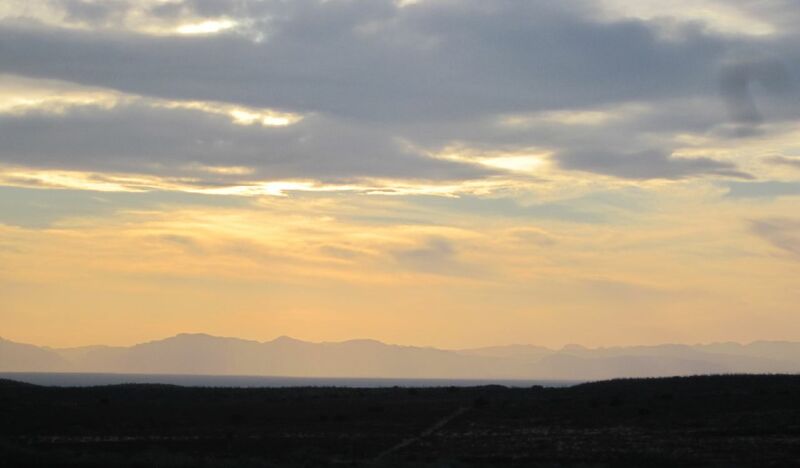 For skies and scenes from all over the world, be sure to visit Skywatch Friday. I found her at a kill shelter; it was to have been her last day. After seeing her crouched in her cage, I promised her that I would take her home. I had to leave her for a few minutes to fill out the paperwork, but I kept my promise and went back to the cage. When I reached for her, she growled at me. I'll always be glad that I didn't let that change my mind. The attendant lifted her into my arms and I took her home, wrapped in a little blanket. I bathed her and wrapped her in a towel and sat with her for a while in the rocking chair. She is a loving member of our family and we can't imagine not having her with us. She still growls when she is picked up and when she first wakes up in the morning. 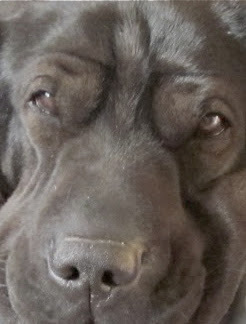 We have had so many laughs with her, because those growls are so at odds with her loving nature and sweet personality. 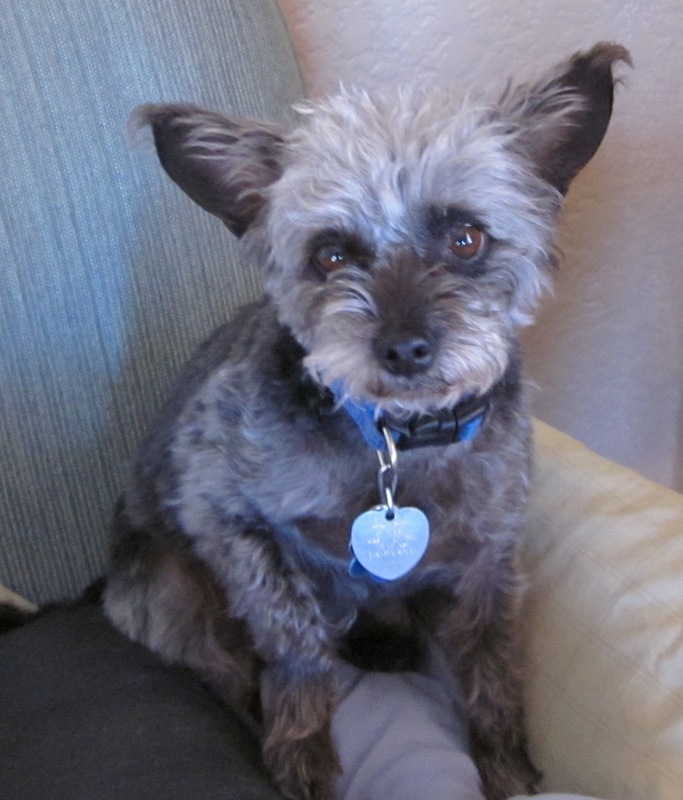 I guess I am asking you to give these abandoned shelter dogs a chance. Scary things have happened to them, and sometimes they just need a little peace and quiet to show you who they are. 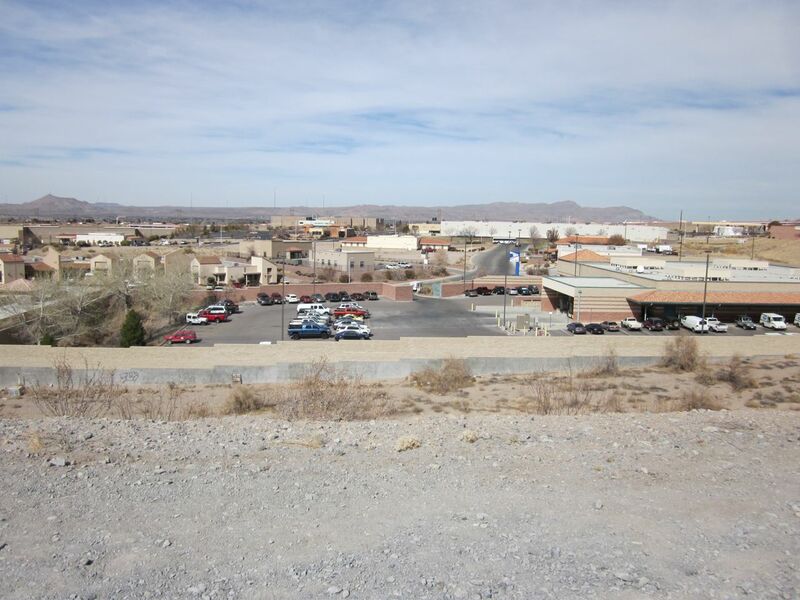 The City of Las Cruces Public Works Dept. recently decided to try out goats for weed control at a local drainage pond. I was lucky to get this shot, as the goats had just about completed their job of ridding the area of tall weeds that were acting as a breeding ground for mosquitoes. A few days later, the herd was moved elsewhere to help out with another project. 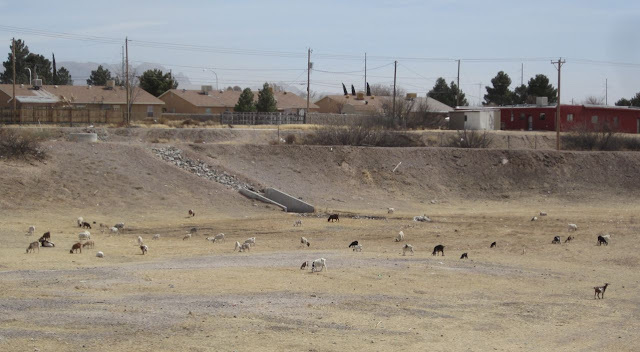 The neighborhood where the pond is located is called "Chiva Town" for the goats that were once commonly kept in yards nearby. 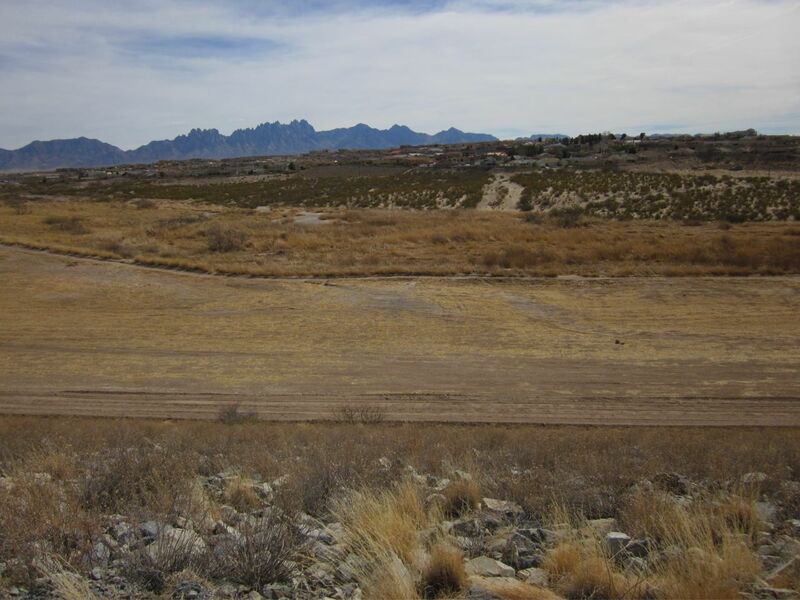 You can read an article about this "green" weed control project in the El Paso Times. 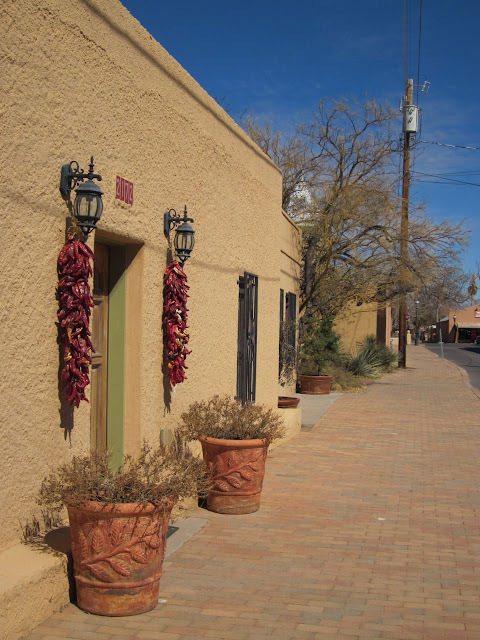 Nothing says Old Mesilla like the texture of thick adobe walls, dried strings of red chiles, old brick sidewalks, and that dark blue New Mexican sky. For skies of every color all around the world, please visit Skywatch Friday. When we lived in New Hampshire, I was fascinated by the Monadnock Summer Lyceum, a series of public lectures and performances for adults (you can read about the lyceum movement in the U.S. here). The lectures sounded so cultured and like such a grown-up thing to do, but they were held in far-off Peterborough on the other side of the state so I was never able to attend. 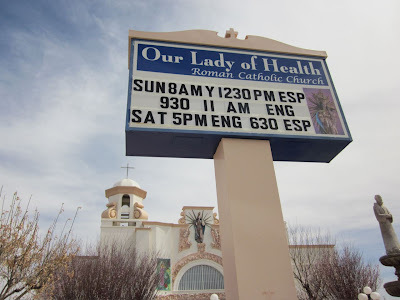 Now that we are retired and living in Las Cruces, we have discovered the Academy for Learning in Retirement and I believe that I have found my lyceum at last. Our first series of lectures is called The Beauty of Mathematics, Old and New. I was a little worried about being able to keep up, but have done pretty well so far. Well, with one exception--the first lecture was on symmetry in the art of M.C. Escher and everything was going swimmingly until the professor uttered the word polynomial and I instantly drifted off in that embarrassing head-lurching way that almost gives you whiplash. Beez poked me back to consciousness and I was hanging on by a thread until the word quadratic sent me bobbing and weaving again. The second lecture was on Fermat's Last Theorem and the lecturer really brought the subject to life. We learned about Sophie Germain (1776-1831), one of the first female mathematical thinkers and researchers. Sophie proposed a plan to solve Fermat's problem, and the professor guided us through the first few steps in a way we could all understand. I loved this lecture--in fact, I wanted to be Sophie and I itched for stacks of clean paper, sharpened pencils, and an infinite amount of time to work out mathematical proofs. I later came across a review for a book called Yearning for the Impossible; The Surprising Truths of Mathematics, by John Stillwell. The review stated, in part, "Stillwell weaves historical details into his writing seamlessly, helping to give the reader the true feeling that mathematics is more than just a bunch of people playing games with symbols, but rather a rich and rewarding intellectual endeavor important to the human enterprise." Now, that is exactly how I felt after the excellent lecture on Fermat and Germain. Not bad for an English major (me)--I tell you, that professor is something else! 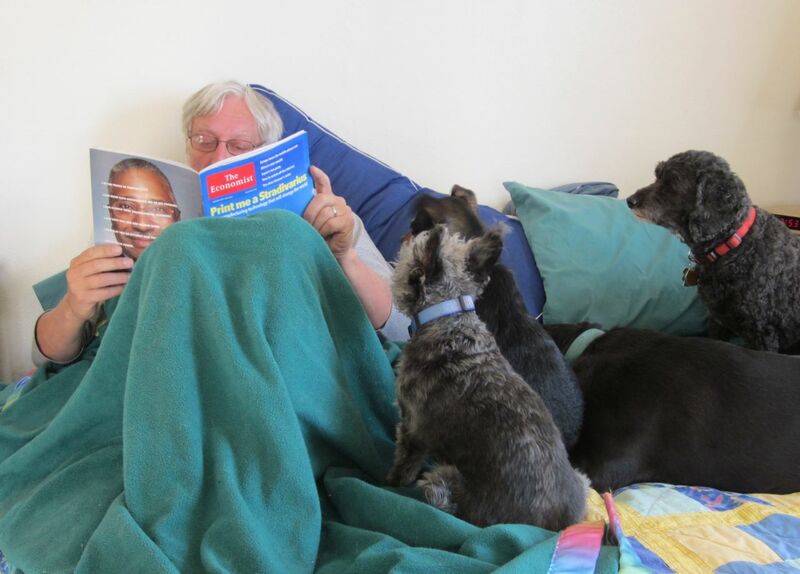 As you might expect, our dogs are quite interested in matters pertaining to veterinary science. Beez was recently reading an article to them from The Economist (Hot Spots; How Changing Farming Habits Threaten Human Health) about livestock-to-human transmission of diseases, and they were absolutely riveted by his description of Crimean-Congo haemorrhagic fever. Hint: Look closely (click to enlarge) and you will see the plate of bread and cheese balanced on Beez's chest. 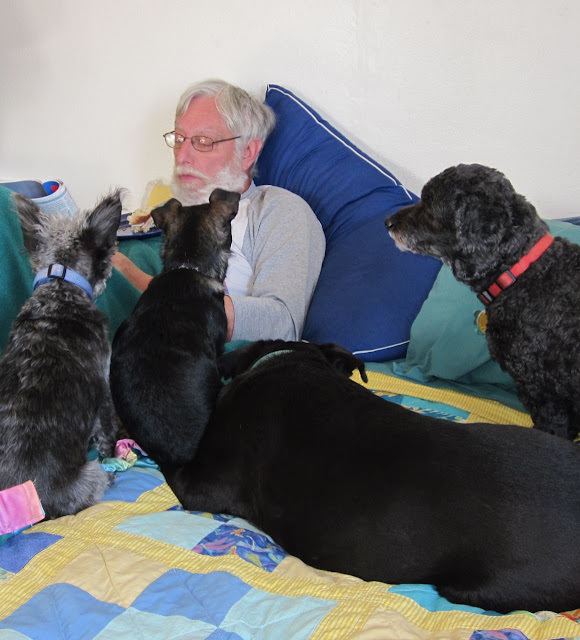 Everyone in our house can multitask, even the recently-retired guy. Around here in southern New Mexico, it's one of those things "everybody knows"--that the blue often painted around the openings into houses is there either to actually repel evil, or because the homeowner has heard that this is an old belief. I checked around and came up with a few links to interesting information (and some wonderful photos) about blue paint on doors, windows, and gates. 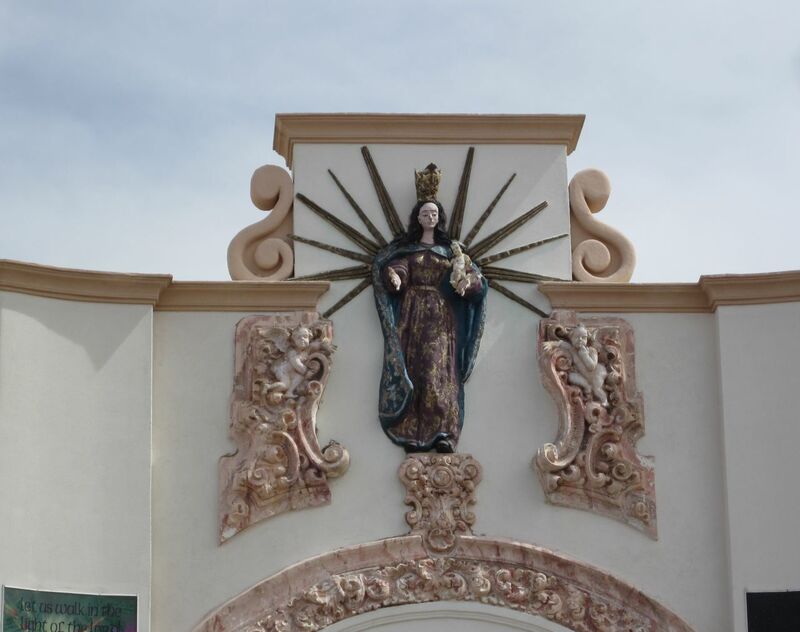 Read The Color Blue for Repelling Evil; on the use of blue paint from Santorini to Egypt, and from Morocco to Mexico. To see photos of blue doors around the world, check out this site, actually that of an electrolysis studio, lol. 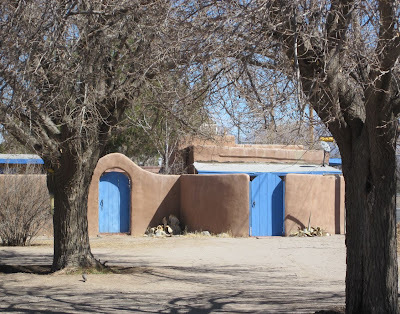 Then you can read about The Secret of Taos Blue Doors in this lovely essay with photos. Blue New Mexican skies and a view of Picacho Peak, framed by an adobe gate at the Mesilla Valley Bosque State Park in Las Cruces, New Mexico. For views of skies from all over the world, please visit Skywatch Friday. As I mentioned yesterday in the post titled Fixer, many of the more tender cacti around town have been killed off by our spell of bitter weather this winter. We should have known better, pushing the planting zones as we do with plants that are possibly too delicate for our temperature extremes. Now we are all paying for our hubris with piles of dead and rotting plants around our yards. 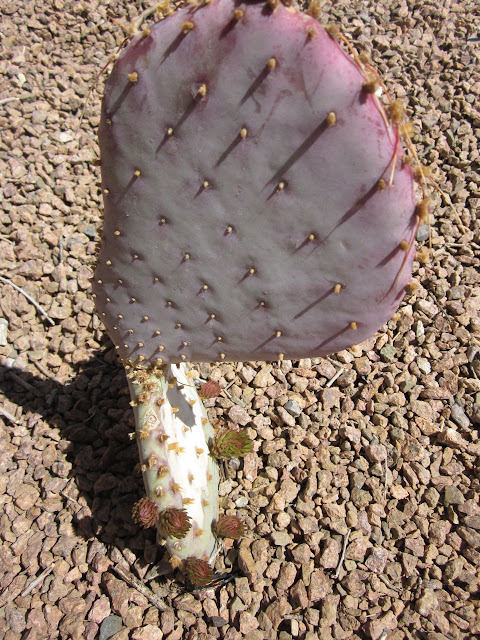 However, this particular form of prickly pear has made it through. 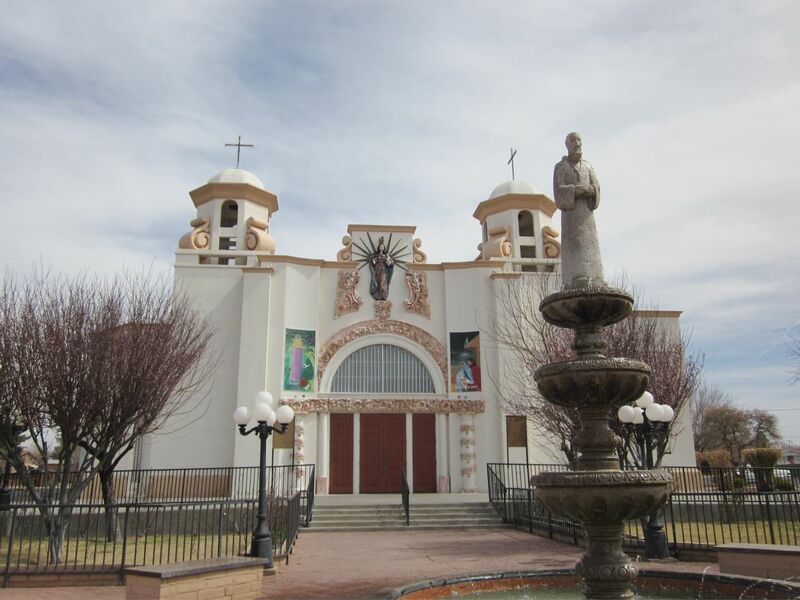 I found this example in Mesilla, but I have a smaller version in my very own yard. We all bear scars from planting it and I don't think anything will ever hurt it as much as it manages to hurt us. Every once in a while, we come across other plants that made it through, perhaps because they were sheltered against a south-facing wall, or maybe because they were watched over by some other form of protection. 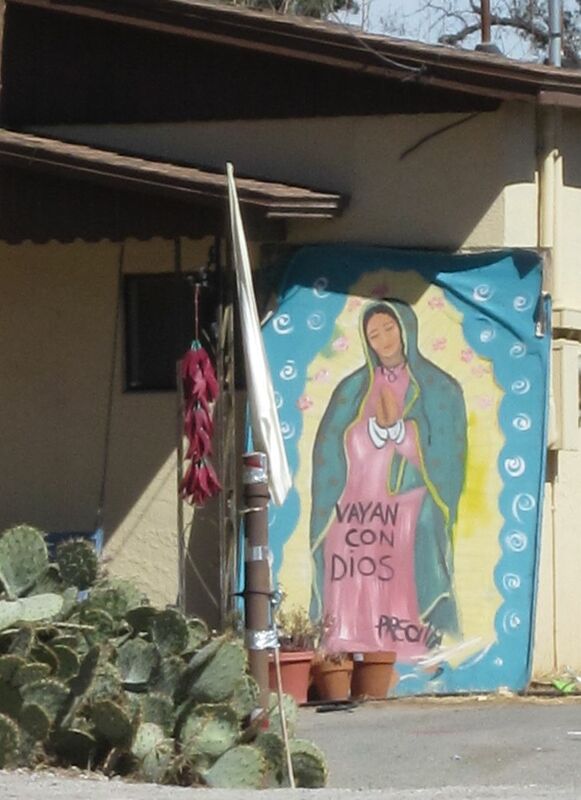 I love this one by a blue gate in Mesilla.